Since moving across the country, I’ve spent more time in airports than ever before. There is a particular loneliness inside an airport. I mostly travel alone; it has been a few years since I last flew with people. Standing in the boarding line, shifting my body into various positions in fruitless attempts to sleep on the plane, even wandering through the same airport hubs—Chicago and Charlotte—I feel acutely aware of my aloneness. Traveling is one of those activities that reminds you of your loneliness. 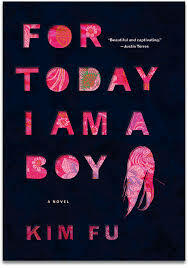 I finished reading Kim Fu’s debut novel For Today I am a Boy while sitting alone on a plane last night, ignoring the vanilla couple sitting next to me, with their sweatshirts and monotonous conversations. I felt my eyes blossom into tears that stayed in place, a briefly gelatinous coating on my eyes. Some people don’t understand loneliness. They are blissfully ignorant. For Today I am a Boy makes me feel lonely. It helps me understand how lonely it can be knowing there is a vast ocean between who the world sees you as and who you truly are. This is the first novel I’ve read about a trans person’s experience. Fiction gives us an amazing gift of helping us to understand what we do not know by getting at us through the tool of empathy. The story follows Peter, a boy who knows from an early age that he is a girl. Born the only son of a Chinese-Canadian family, Peter immediately feels the pressures bestowed upon him by his traditional father, a father who sees Peter as his gift of legacy, the boy-king amongst three sisters. Peter spends his childhood trying to make sense of the cruelty of young boys and enchanted by his older sisters—their overt femininity, makeup, and bras. Fumbling through adulthood, Peter has two significant relationships with women in his attempts to fulfill the role his father has deigned for him. Even as he becomes painfully aware of his father’s flaws, even after his father dies and his judgmental eyes can no longer look at him questioningly, Peter moves through life as a dual personality—the man presented to the world and the woman Peter truly is, but only fully, at home. “A thought appeared in my mind, unbidden, as a fully formed sentence: this is the most unhappy I have ever been.” I found myself rooting for Peter like you would a hero in an adventure story. Yes, try on the dress and high heels. Yes, befriend the trans man who reaches his hand out to you like a friend and savior. Yes, let your sisters call you the name that has gone unspoken your whole life, sister. For Today I am a Boy could have easily slipped into Lifetime movie territory, into an after school special about tolerance and acceptance. But this book terrifically refuses to be boxed in. It never says, “Look at Peter, the other, and Peter’s struggles.” It says, “Look at how we all struggle. Look at how our loneliness is universal.” It shows the loneliness of the wife of an adulterous husband, the lesbian subscribing to a religion that daily condemns her, the teenage boy who knocked up his girlfriend and never left his hometown, and the father who alienates all of his children because he can’t find a way make peace with who he wants his kids to be and who they are. I felt an acute pull in my heart reading Peter’s story, hoping for his, for her, happy ending. But I realized it’s never so simple, not in a book and not in life. Peter’s story, Peter’s personhood, is ever-evolving. I want all the Peters of the world to become the people they always were. I want more writers like Kim Fu to tell Peter’s story. Glad to hear it and my pleasure. One of the joys of reading is sharing what you’ve read with others. Let me know how you like it.